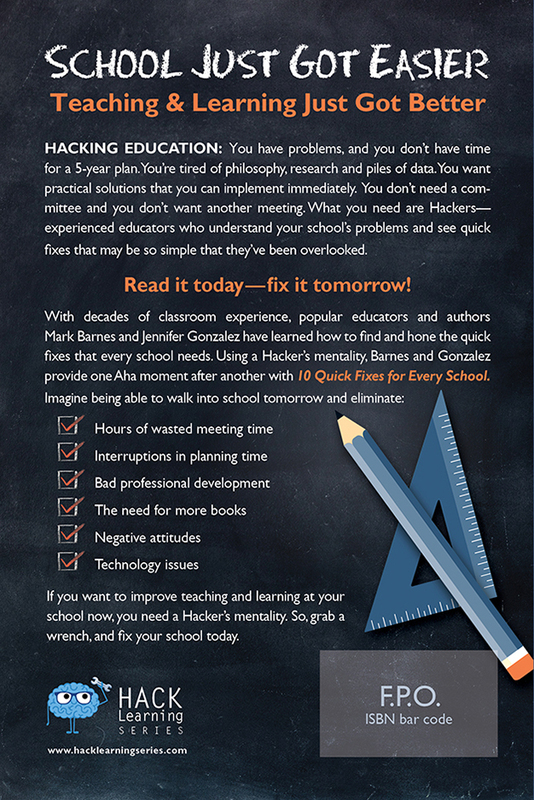 Yesterday, I got the privilege of previewing Mark Barnes and Jennifer Gonzales’ forthcoming book Hacking Education: 10 Quick Fixes for Every School. It comes out in the next week or two, and it’s a read that I would snag right away if I were you. Hacking Education is a quick read, perfect for every single educator on the planet. The layout helps with that–every one of the ten chapters is laid out in beautiful headings and with the same format. Most of all, it fits my #1 criteria for education books: Practicality. Every reader will immediately latch on to at least one or two of these quick fixes and can implement it into their school in August. This book goes beyond the classroom teacher to everyone on faculty. 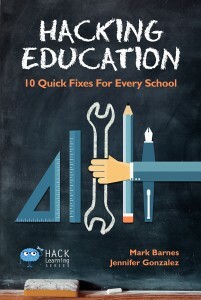 It’s a fabulous book for administrators–if I were a principal (God bless administrators–I could never be one), I’d still be latching on to several of these hacks to make school more efficient and effective. My favorite hack, you ask? (OK, so maybe you didn’t ask.) The Pineapple Chart. The teachers in our (literal) corner of school often talk about the wish to watch other teachers. How do they teach? Manage classroom? Use technology? We all lament we never get a chance to do this, but have we done anything to remedy it? Nope. That’s where the pineapple chart comes in. 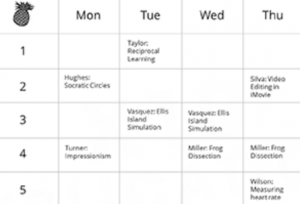 In the teachers lounge, draw a chart on a white board outlining the periods of each day. Teachers who are open to visitors can sign up along with the topic or feature of that day. Other teachers are welcome to pop in for a few minutes or the whole period. How do you get this started? What obstacles are you going to face–and how do you overcome them? Get this book, because Mark Barnes and Jennifer Gonzales address the How-tos and the potential pitfalls of every hack. The Pineapple Chart is obviously a great way to share new teaching techniques, new activities, and new technology–a huge benefit to teachers. But I’m also thinking of the benefit the Pineapple Chart can have on students and the culture of a school. Imagine a school where students frequently see other teachers in their classrooms. They see the investment other teachers have in their learning, that teachers care about what’s happening in other classrooms, not just their own. Imagine the basketball players seeing their head coach sitting in an art class, gleaning ideas to apply in his geography classes! (Granted, I teach in a small high school where students generally know all the teachers). This simple strategy can be a great way to strengthen a culture of education among staff AND students. 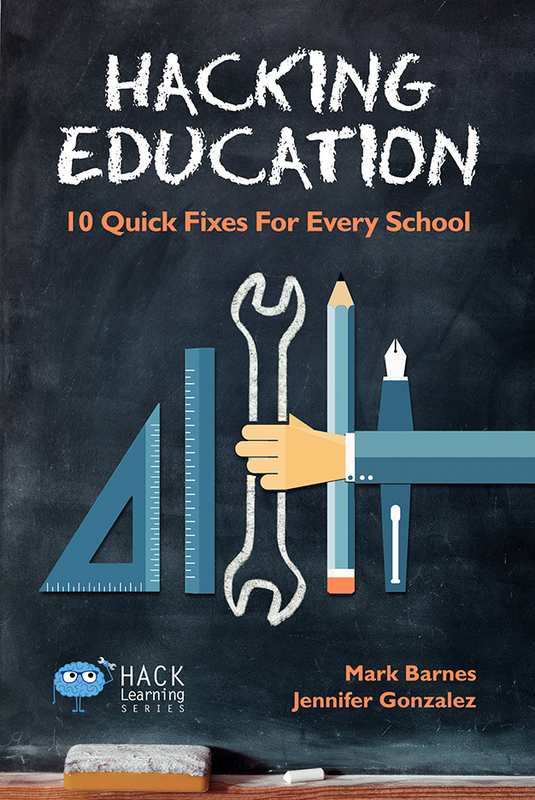 Hacking Education: 10 Quick Fixes for Every School is scheduled to be available on Amazon by early August. As soon as its page is up, I’ll link it here! Can Struggle Lead to Autonomy? AppSmashing w/ Haiku Deck, Canva, Camtasia, and Zaption!